My son Joshua wanted a “magic show” for his 8th birthday. He really loves magic. 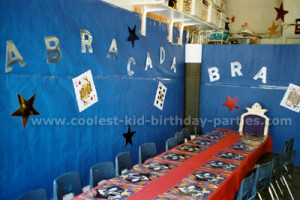 All of the theme party ideas needed to have a magic part to them, including the games, the cake, the party goods and the decorations. I purchased the magic party goods from Birthday Express, which were perfect since they were in the colors my son loves. I sent out the invitations a couple weeks before the party and the kids were all talking about it at my son’s school. 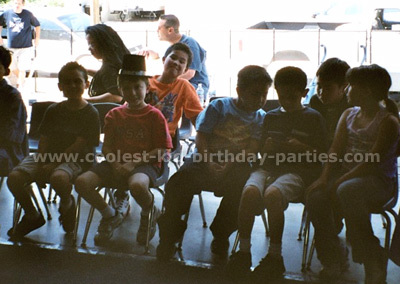 We have our parties in the garage and front yard since there is a lot of room and we usually have quite a few people at our parties. 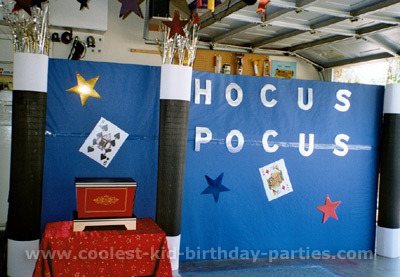 I wanted the garage to look like a stage for the magic show. So I made six-foot tall magic wands to hold up my theater walls and then decorated the walls with magic woods, cards and stars. I hung stars from the ceiling with nylon thread and everyone thought they were floating in air. I made a 4ft. tall white rabbit and had him standing where the magic show was going to be. It looked like he was going to do the show. Our party started at 1:00pm . Many of the parents were dropping off their kids and we told them that they could be picked up between 4:30pm – 5:00pm . 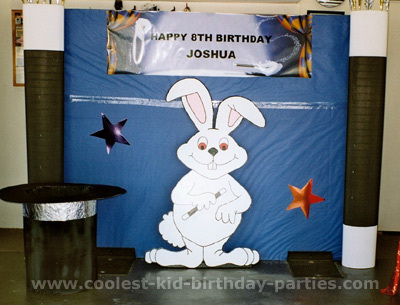 Our theme party ideas for games: “Magic Rabbit” or hot potato; I played music from a magic show CD during this game and the kids passed around a white rabbit. The kids had a fun time with that. We also played a magic sword ring toss. The final game we played included tossing large playing cards into the magic black hat, which was about 3ft. tall and 3ft. wide. I made it out of black corrugated paper. The kids wanted to keep on playing. We gave out prizes to everyone that played and the winners were given a little something extra. This way no one gets upset, since our parties usually have kids ages 3-12. Everyone was given a black top hat, a wand, a pair of white gloves, a white rabbit and a deck of cards. For lunch we just served pizza, fruit cups and punch. My son didn’t ask for anything creative, but just wanted to have something he likes to eat. The magician arrived just after we had finished our lunch. So while he set up in the garage, we had 20 magicians running around the front yard. Now it was time for the big show, the kids all sat down in the front rows, while the 16-18 adults made up the back rows. Everyone really enjoyed the show and the magician had many of the kids come up and help him, not just the birthday boy, which was really great. The magician held their attention for an entire hour and they could have sat there even longer. After the magic show we had cake. 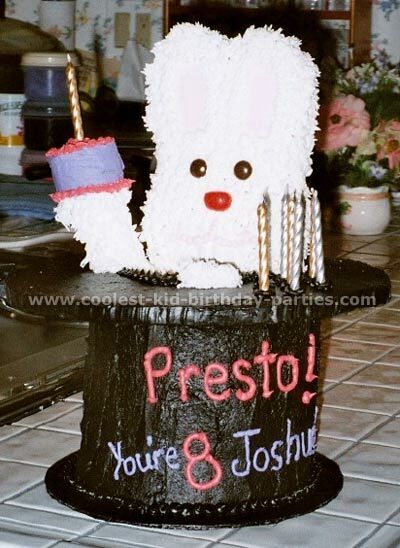 My son had told me he wanted a cake that looked like a rabbit coming out of a hat, which I found on the web. Since we had so many people at the party, I decided to have the cake only for blowing out the candles, and served cupcakes instead. Each cupcake had a homemade cutout of a rabbit coming out of a hat on it. This worked out really well and it was so easy when someone wanted seconds. 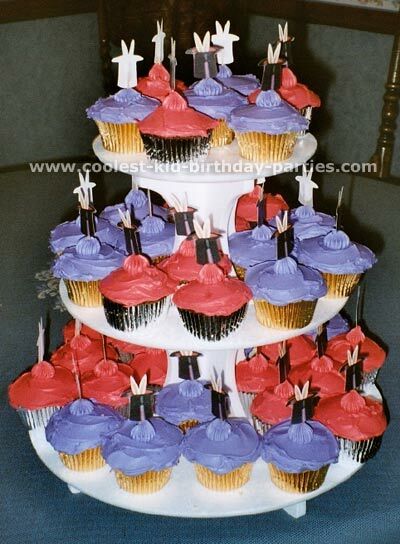 I served the cupcakes on a cupcake tree. It looked so nice with the cake. When we finished the cake we opened the presents. Everyone was given their goodie magic box, just as my son started opening his presents. This way everyone has something to open. The goody magic box had magic tricks, magic pads, flashing jewelry and other magic related items in it. After opening the presents we took out the piñatas. We had one piñata that was a white rabbit coming out of a hat, but it was too small for everything. So I made a second one that looked like a big playing card. Since we do it in the garage, they are the pull string type, so when the first one broke open, I pulled open the second one at the same time. The piñatas were mainly filled with toys not candy, which was a big hit with the kids. I imagine it was a big hit with the parents too. By this time it was just a little after 4:00pm and the final activity for the day was going to start. My son Joshua and his brother Aaron did their own magic show for their friends. They had been practicing for weeks. Their friends thought this was great and so did the parents. Everyone (adult and child) had a great time. 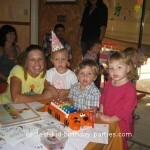 The following week at school the teachers told me that during their share time, all the kids talked about was the party. It was a lot of work, but it is well worth the memories I am giving my children and their friends. 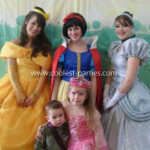 I hope my theme party ideas will help you conjure up your own magic theme party ideas.